Bling wheels – the craziest thing I’ve seen so far are Dub’s Pimp Star wheels, which can display a picture of your choice on the wheel, or a slideshow of pictures even! 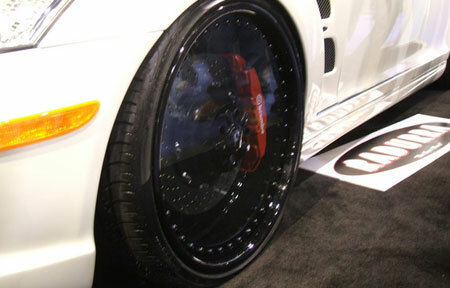 This set of wheels take the whole bling wheel concept the other direction – no spokes at all, nothing! A plain clear view of the massive disc brakes you have. D’Vinci Forgiato Radurra wheels are made from polycarbonate, and comes in either 1.5 inch or 2 inch thick sizes. They cover the whole wheel. Scientifically, polycarbonate is supposed to be able to withstand temperatures of up to 267 celcius, so it would be interesting how it would stack up to the heat generated by heated up brake discs. A solid polycarbonate also doesn’t give the discs much airflow to cool down. Previous Post: Miata fighter – 2010 BMW Z2?